A lovely walk through ancient woodland. It's well signposted throughout. Just follow the waymark posts with the green arrows and the White Admiral butterfly. Can't go wrong. About half way round you could take a detour to The Woodman & Olive at Wormley West End (check opening times first). 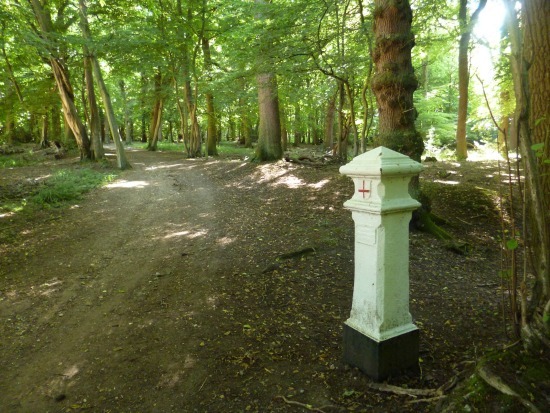 When you have done this walk try out Walk 27: Broxbourne Wood North Loop. This one is easy. Just park in the Broxbourne Nature Reserve Car Park (West), walk up to the route map, turn left and follow the green signs with the black butterflies clockwise. Eventually you will come to two open fields, cross them and emerge on White Stubbs Lane. Cross with care and your way is directly opposite, again following the signs with the green arrow and black butterfly. The butterfly pictured on the signs is a White Admiral, and we were lucky to see one on the afternoon of 15 July, 2013. Magic. The path weaves round left then right and emerges to cross West End Road and head back into the woods. You then have a pleasant open bit heading west until you drop down through Wormley Wood. Keep to the waymarked path and you will swing round to the south, then west, then north and back up to White Stubbs Lane. Cross the lane and head down a shaded path between two fiels which swings round and emerges on Brickendon Green (which despite the name is a lane). Turn right down the lane looking out for a path on your left. Take this path and when you come to a junction in the path turn right and walk back to the car park. For accurate directions it's probably best to print out the map of Broxbourne Nature Reserve, which is excellent.